Wells Fargo Launches NFC-Enabled ATMs, Though Rollout is One Year Behind Schedule | NFC Times – Near Field Communication and all contactless technology. Wells Fargo finally made good on its pledge to NFC-enable a significant number of its ATMs, though it is behind schedule and trailing some major banks in other countries. Capital One: Ready to Make a Move into Mobile Payment? NFC TIMES Exclusive Insight – Wells Fargo, the third largest U.S. bank by assets, made good on its pledge last March to launch NFC-enabled ATM cash withdrawals by the end of this year, although that is one year behind schedule, and Wells Fargo is far from the first major bank globally to support the technology on ATMs, even in the U.S.
Wells Fargo had introduced cardless withdrawals without NFC last March, giving its 20 million mobile-banking customers the ability to make withdrawals at any of the bank’s 13,000 ATMs by requesting an 8-digit access code in their apps. Tuesday it announced it had equipped more than 5,000 of those ATMs to also accept NFC phones, enabling customers with Apple Pay, Android Pay, Samsung Pay and the bank’s own Android-based Wells Fargo Wallet to tap to initiate withdrawals before entering their PIN codes into the machines. But Wells Fargo had earlier pledged–in May of 2016–that it would introduce NFC-enabled ATMs to 40% of its ATMs by the end of last year, a goal it moved to this year without explanation. 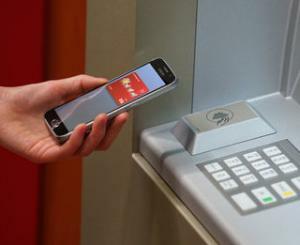 The bank is believed to have equipped a small number of NFC-enabled ATMs before this month. Article has about 700 words.